What an incredibly fabulous treat this past weekend has been. My flat has been super busy filled with fabulous people. I have been playing host to my friend Jen who has flown in from Ithaca, NY, USA to in turn catch up with her old school friend, Susie. Susie was diagnosed a few years ago with a brain tumour. She’s an amazing lady and I’ve had the pleasure of visiting her when she was admitted to hospital in London – I was the ‘courier’ for the safe delivery of goodies such as garibaldi biscuits on behalf of Jen. From the very first visit we’ve had a jolly good giggle and I felt that I’d known Susie for years too! Susie and I have kept in touch via email when she went back to the ‘country’. So in order that Jen could make the most of her short time in the UK and see Susie for as long as possible, I hosted the weekend for them both. Of course, selfishly it was also utterly brilliant that I could see them both and join in on the laughter, giggles and tears. Poor Jen had a hairy journey though starting with the cancellation of her flight from Ithaca to New York! So, stalwart that she is, she jumped in the car and drove to NYC, stayed in a hotel for 2 hours (the most expensive hotel stay ever!) and meet her “connecting” flight to London Heathrow. 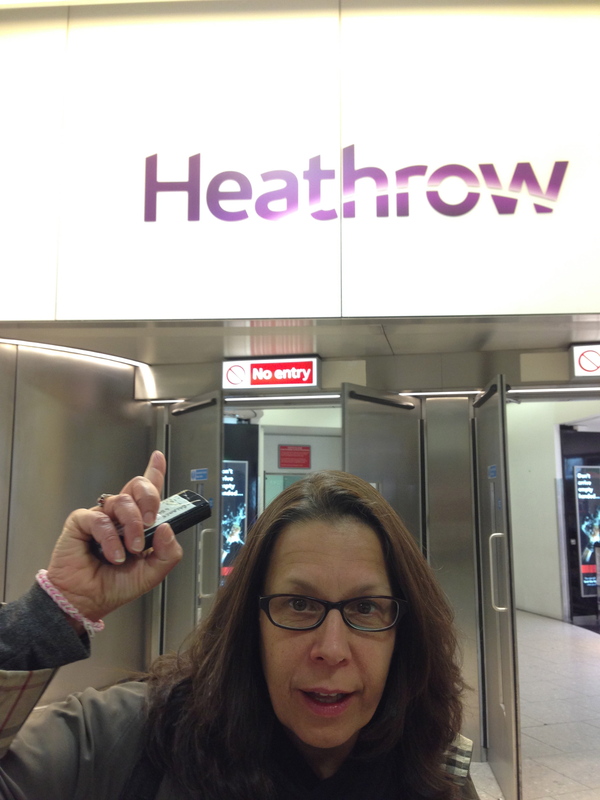 Poor love doesn’t sleep on planes so was utterly exhausted when she was met by me on Thursday evening at Heathrow. She’ll hate me for posting this… but the ‘sleep-deprived arrival’ photo. A short time for gossip and catch up on the journey home and cups of tea before collapsing into our beds. Hehe Jen awarded me a 4.5* rating for my accommodation when I presented her with freshly ironed bedsheets, fluffy towels, hot water bottle and dressing gown… but I lost half a star when we could only find one slipper! Friday was a late start, a lot of tea and gossip and then headed out to the tube station to collect Susie, who had set out early from the country to travel to London. A late lunch, plenty more tea and gossip and we headed into Victoria where we met up with another old friend of Jen’s from University for a quick drink. Susie and I then headed off to Waterloo to meet up with some friends of mine and to see Fascinating Aida. What a total tonic that show was for us all. After the show Jen met up with us and joined our party for dinner before heading home in a taxi and quickly to bed. On Saturday morning I was first up and eager to try out my new waffle maker. When I stayed in Ithaca last year Jen’s daughter surprised me when she made waffles all on her own. They were, quite frankly, blooming spectacular. No mean feat for a young girl and I aspire to be as good as Ruby one day. I had asked and she’d sent me her recipe. The new waffle maker had arrived on Wednesday. I was ready to go. Inevitably I need more lessons to perfect the Ruby-Waffle but I did OK. Enjoyed by us all over a lovely long breakfast with yet more pots of tea and coffee. Saturday afternoon we’d arranged to meet another old school friend of Jen and Susie and another University friend of Jen at London Bridge. 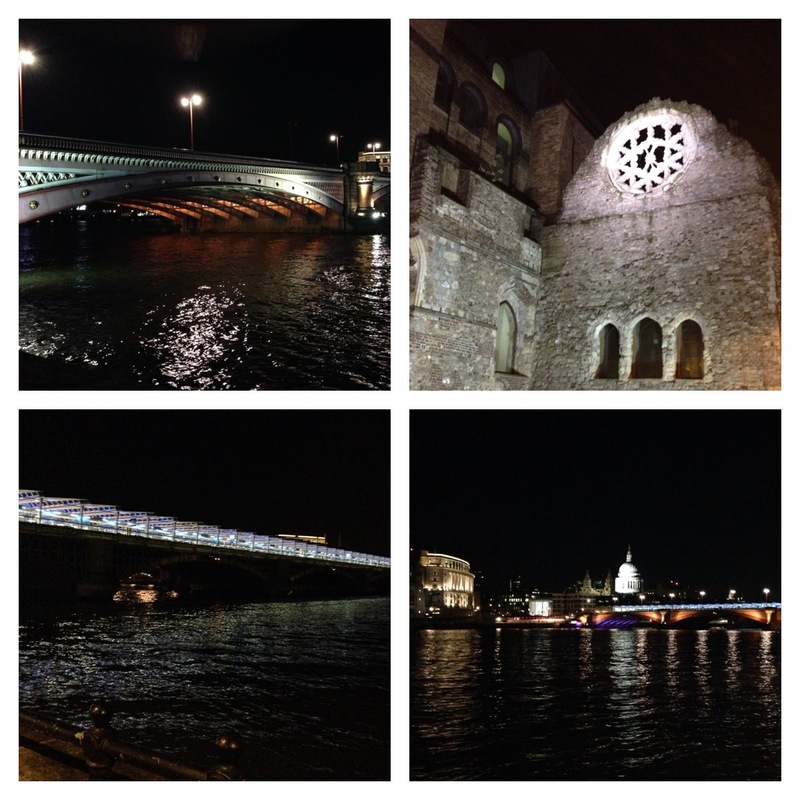 We set out and caught a train to Waterloo in favour of a sunny winter walk along the Southbank. Sadly full of tourists but a beautiful walk nonetheless. We managed just enough time to nip into an small art gallery enroute and see some wonderful pieces. 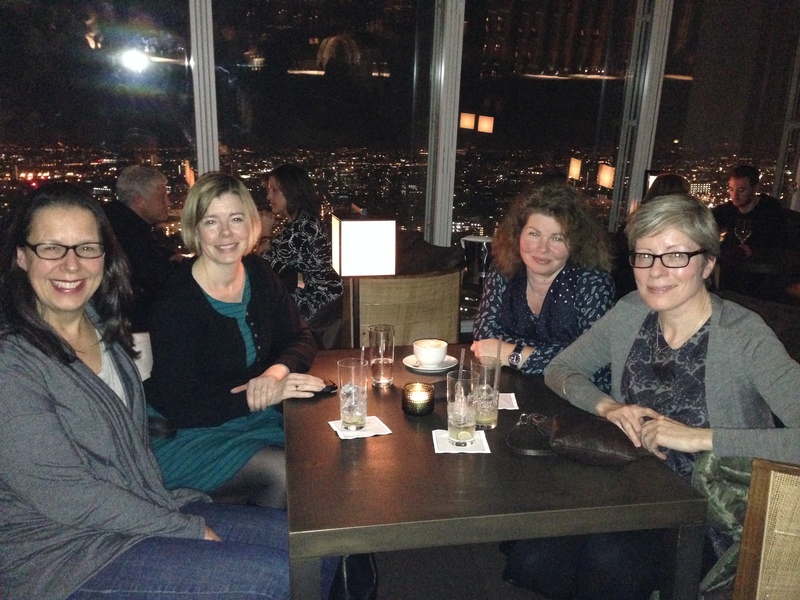 We met up on time and then decided to see if we could get a coffee/tea in the bar up the Shard. We weren’t going to be paying the ridiculous cost to go up to the viewing platform on the 72nd floor and are quite content with the view from the 32nd floor. Only a short wait in line and we were on our way. I think we also chose the perfect time of day to arrive as the daylight was leaving us and the London lights were beginning to sparkle. Looking down on London as the light changed was mesmerising. I think, if you’re thinking of going to the Shard and to avoid the queues I’d consider booking afternoon tea for the princely sum of £35. Not cheap but if you time it right you’ve got your table guaranteed for the time of your tea, no queuing and a tip-top tea into the bargain. 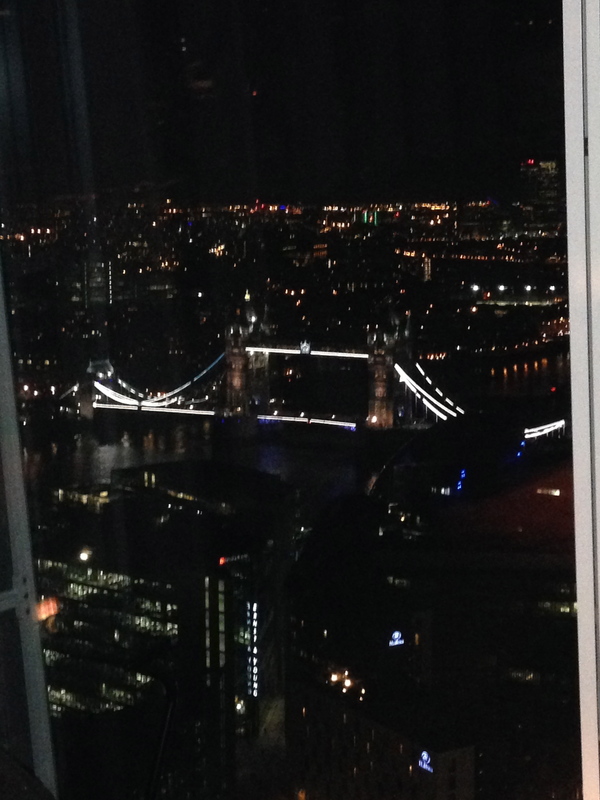 I think the 72nd floor viewing deck ticket at £25 for a timed visit is overpriced. For £10 more you’ve got an afternoon tea and an incredible view – who needs those extra 40 floors – London looks great from 32! (£0.35p/floor Shard -v- $0.31/floor Empire State Building). 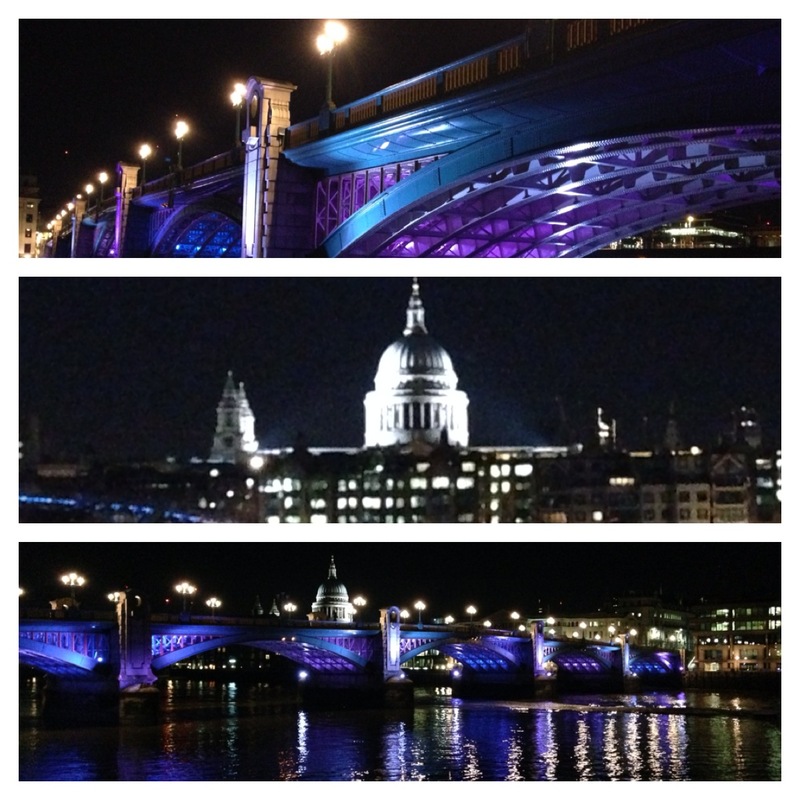 After our ‘drinks with a view’ we made our way back along the Southbank, stopping only for a quick bite to eat at the best Pizza Express venue with views over the river to Londontown. Exhausted we all fell into our beds shortly after making it home. Sunday was a very slow start. 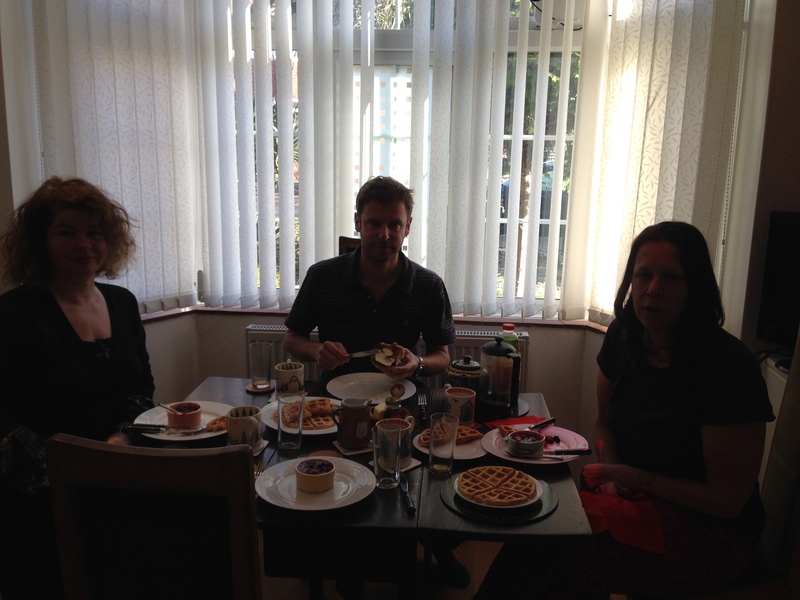 Us all in our PJs, cups of tea in hand, chatter and breakfast. The reality was that the weekend was drawing to a close and still there was so much to say, share and listen. So very difficult sometimes to be true to what you want to say when discussion are held over Skype or the telephone at other times. As an observer to some of the conversation though I can see the true friendship between Jen and Susie that has spanned 40+ years since primary school, childhood friends and close neighbours. To listen to their stories about cycling to school together and the mischief that they caused and their shared experiences and adventures – magical and I was honoured to listen in. Never long enough to say it all but so very easy to see the love shared. We drove Susie to Paddington to catch her train home, stopping briefly for a cuppa and final farewells. Jen came back with me for a while, a delivered English curry meal and then I put her on the tube to her brothers for a final 2 nights in London. Given that Jen was on a different timezone, my constant fatigue and with Susie’s treatment, we all did remarkably well fitting everything in and to keep going. I’m know, like me, the others also slept well when they both made it home. No matter how long it’s never long enough. However we’ve learnt to treasure every moment, every laughter, every view and every memory. This entry was posted in Home, Living, Support and tagged Home; by AnnaGoAnna. Bookmark the permalink.